Water leaks cause damage, waste money and can be found anywhere in your home or business facility. Locating under slab water leaks in pipes used to mean damaging and invasive exploratory digging that was time consuming and expensive. Our skilled technicians use state-of-the-art leak detection equipment and techniques including ultrasonic leak detection to pin-point the location of under slab leaks. Not only will we find your leak quickly and cost effectively – we’ll repair it, too. We provide leak detection and repair from our Englewood and Punta Gorda locations to the surrounding areas. Our expert technicians are committed to locating your leak quickly, accurately and with minimal damage to your property. Call Ray’s at 941-629-2500 for expert leak detection and repair services today! How do we locate underground leaks? Your leak will be located using an “electronic stethoscope” to isolate the noise created by the leak. Because small leaks are sometimes difficult to identify, compressed air or inert nitrogen gas is injected into the piping to aid in the location process. How accurate is Ultrasonic Leak Detection? Our “target accuracy” for leaks out in the open is 12”. For leaks in the vicinity of a cabinet or other obstruction, our target accuracy is 18”. We meet our target accuracy over 95% of the time. On commercial jobs we allow ourselves more leeway. 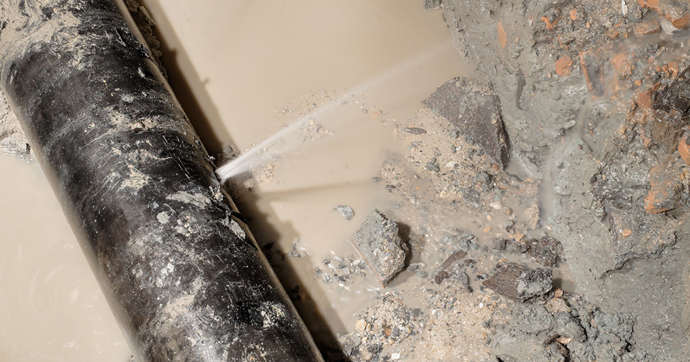 Locating a leak is a process which sometimes includes an initial test and/or discovery excavation. This hole may turn out to be the first step of the leak location process. Do I need to move my furniture and appliances? In the process of locating a leak it may be necessary to move furniture, appliances or cut and roll back carpet or vinyl. Depending on circumstances, the technician may, at his discretion, attempt to do these tasks himself using reasonable care. Also, at times he may need to disconnect fans, refrigerators, air conditioning or other equipment that may interfere with his testing. In any case, by allowing us to attempt these tasks in our leak locating process, you assume all responsibility for any damage incurred as a result and any costs to restore the affected items to their original condition and placement. Damage is rare, however it is possible. As an option, you could have a professional mover or flooring installer do the preparatory work needed. Our technician would return when the testing area is cleared and ready for inspection. How can I assist my Ray’s technician? The technician needs your cooperation. During the leak detection process it is necessary to curtail all water usage. It is imperative that no water be used during testing and that activity in the general area your technician is working in be kept to a minimum. While using certain pieces of equipment, any movement on the floor is distracting and may make the technician’s job impossible. How long will it take to locate the leak? The location of a leak may take anywhere from 1 to 5 hours and occasionally more than one trip to complete the job. The more you cooperate with the technician’s instructions, the quicker his task can be accomplished. Could I have multiple leaks? It is unlikely that there is more than one leak in your system. If a system does have multiple leaks, they are usually only inches apart and found during excavation. In the unfortunate circumstance that you do have multiple leaks, please understand the limitations of our services and our charging policy. If you have multiple leaks, your technician will be finding only the leak with the best “signature”. Location of the other leaks can rarely be verified until the first leak is repaired. What causes leaks in the first place? There are numerous opinions regarding the cause of undergrade leaks. Many are indigenous to the material used. While the list below is not all-inclusive, it is representative of problems we have seen. What if my leak reoccurs? We do not recommend pursuing leak after leak in your system. You may never get another leak in your system, but if you do, regardless of whether your leaks are five months or five years apart, you can expect more. If this is your second leak, ask your technician to explain how your system could be re-piped. Understanding repiping and its cost will prepare you should it become necessary. Will my insurance cover the cost to repair the leak? Once the leak is detected, will Ray’s repair it? Unlike other leak detection companies our services are not limited to leak location. Our experience and licenses allow us not only to locate your leak but to effect permanent repairs as well. Call us today at 941-629-2500 – we’ll be right over! Hire us for a service today, or click to get a $25 coupon toward your leak detection service.